When it comes to writing, I often find the smallest details the most confusing. Take titles for example. Which words should I capitalise? How long should my title really be? What about ‘keywords’? Am I the only one who worries about these seemingly innocuous formatting issues? During an afternoon of extreme procrastination, I found myself Googling titles, grammatical terms, style guides and SEO amongst other things (I was avoiding editing an entirely different post). I’ve put together this little reference to help me — and maybe you — in the future. 1. How Long Should a Title Be? I’ll start with this question, as it’s the easiest to answer. Well sort of. Page titles should be ~60 characters or less, including spaces. This is according to Moz; my preferred authority on all things search. Following this rule should mean that your title won’t get cut off on Google search results pages (leaving users confused as to the content of the link). Within this ~60 character limit, you should include your brand name, appended to the post title. 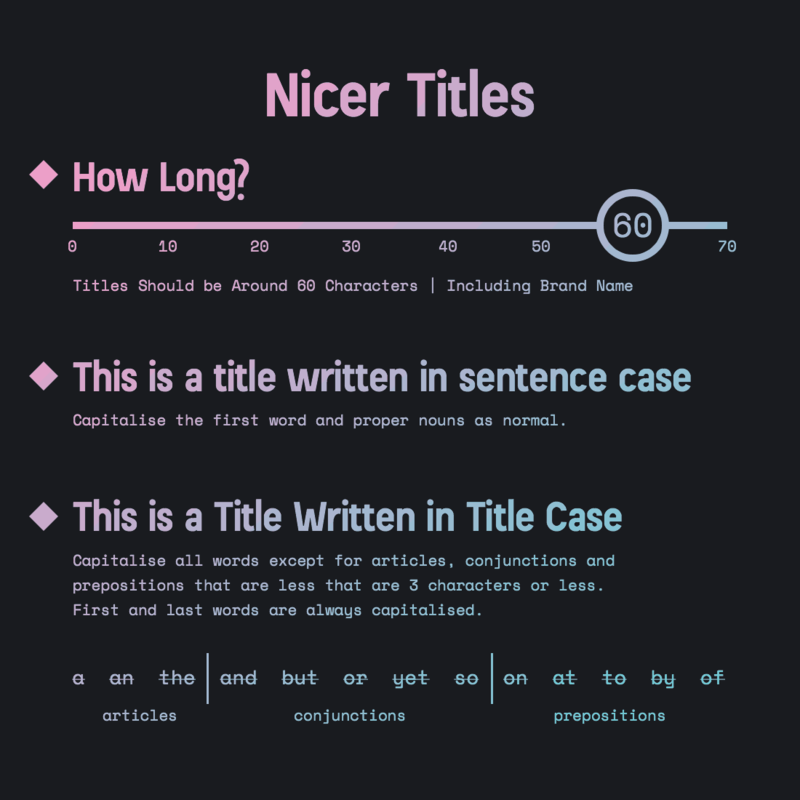 Like this: A Quick Guide to Formatting Nicer Titles | rorymacrae.co.uk. This is good practice from an SEO point of view and nicer for users (brand association etc.). If you don’t append a name, Google will normally do it for you. But not necessarily in the way you’d like. So you might as well just add it yourself. The ~60 character limit guideline is specific to meta page titles, i.e. the <title> HTML tag. This does not have to be the exactly the same as the headline that you see on the page (an <h1> tag normally). Titles and h1s should not be so different to one another that they’re misleading (bad for users and search) but the two tags can vary slightly. Many CMS’s automatically set the title and h1 as the same thing, but this can be circumvented with tools like Yoast SEO for WordPress. There is obviously no character limit for these headlines as they only appear on your site (not on search results pages). It seems logical therefore that a page headline could be a little longer than its corresponding <title> tag*. Some people actually suggest writing three different headings for an article; the title tag, the text that is displayed on-page and a social media friendly headline. * You can see this in action on the Daily Mail website (urgh). They seem to run huge headlines in their ‘articles’ but use much shorter and search friendly page titles. So really, the answer is that a page title should be ~60 characters including brand name but a page heading should be as long as it needs to be, but no longer. I think that succinct and focussed headings are normally better for users, so we need to strike a balance between brevity and comprehensiveness. ‘Keywords’ are the specific search terms that you want to rank for. Some SEO tools (such as the aforementioned Yoast) nudge you to use an exact match in your title for the keywords that you’d like to appear on search results pages for. Many people also suggest that you fit your keywords at the beginning of the title. I’ve found that following these rules can lead to some pretty long and clunky headlines however. Especially if you’re trying to target the long-tail. In turns out, writing ‘exact match’ keyword titles is becoming an outdated technique. There is little correlation between having an exact match for a keyword in a title or h1, and having high Google rankings. Far more important, it seems, is search intent. Which Google is rather good at guessing. So, as long your article is good quality and is actually about the thing that you want to rank for, you probably don’t need to obsess too much over whether or not your title matches your target keywords precisely. Phew. Perhaps you don’t care too much about search. 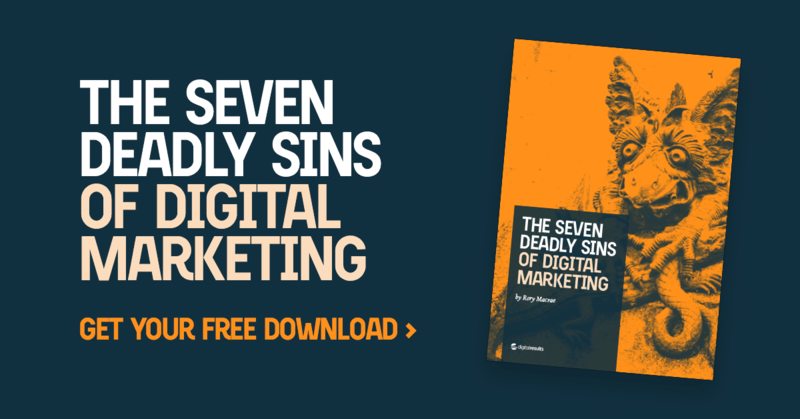 And if your content is like really really f…ing good, it should hopefully rank anyway. So, onto my next formatting conundrum. 3. Which Letters in a Title Should Be Capitalised? There are several ways in which you can format a headline. Choosing one and using it on all titles and subtitles will help to reinforce a consistent brand voice. This is the easiest format to follow as there isn’t really anything to remember. Just write your headings as you would normally write a sentence (without the full stop), capitalising only the first word and any names or places etc. Sentence case tends to be favoured by high-brow British media and can be seen on sites such as BBC News, The Guardian and It’s Nice That. This is where I begin to get confused. Title case is where most of the words in a title are capitalised. Which ones kinda depends. Title case is the prominent style used on blogs and it is also favoured by some American news outlets, for example The New York Times and Bloomberg. In the past, title case was used as a way to add emphasis to a headline. On a typewriter for example. But we have font weights and sizes to do that job now, so it’s really just an aesthetic preference. So how do you know which words to capitalise? Well, the rules actually vary slightly depending on which style guide you subscribe to. Style guides are a detailed set of writing standards and guidelines for publishers to adhere to. Large publishers (such as The Economist) tend to have their own house style, which is normally based upon one of the major style guides. Prominent guides include; Oxford Style Manual, Chicago Manual of Style and Associated Press Stylebook, amongst others. The first and last words are always capitalised. Articles (a, an, the), conjunctions (and, but, or, yet, so) and prepositions (on, at, to, by, of) should not be capitalised. All words that are four or more letters should be capitalised regardless of what type of word they are. Some styles suggest a different number of letters, but I think four looks nice. If in doubt, here’s a handy little title case tool. This one’s really simple, just capitalise every word. It’s One Weird Trick To Make Your Titles Look A Bit Spammy Though. Unless you are a major publisher working with a large team of writers, you probably don’t really need to define a long and exhaustive writing style guide. But setting some basic title formatting guidelines at the very least is an important ingredient of a cohesive brand. Deciding how you’re going to write your titles is the very first step to defining your voice. Plus, it’ll help you quickly set up your content ready for search engines. Many formatting options, including those relating to titles are simply personal preference but the key is to remain consistent in whatever you chose. I hope that this has been of some use to you.